On the Wye sat UP#4952 SD70M w/Flags and UPP#5449 Business Car Arden poised to make the 100 mile trip to Valley Junction. Departure time was scheduled for 12:30PM. Ron had won a UP Employee Club contest that had a wonderful prize. Mr. Steve Barkley VP UP Southern Region was providing the Arden for a trip of a lifetime. Ron along with his wife, son, son's wife and a niece who came in Tuesday from St. Louis were set to go. Most excited was Ron's other two guests who were myself and my wife!! With temperature and humidity high it was prudent to board the Arden after photos standing by the car and locomotive. The parlor? area at rear of car seated 8 including the chair at Mr. Barkley's desk. Had radio set to 4848 for Navasota Sub. and dispatcher gave clearance to enter main track about 12:22PM and exactly at 12:30PM the train did in fact depart. As we were departing we found it was to be a 2 1/2 to 3 hour trip. 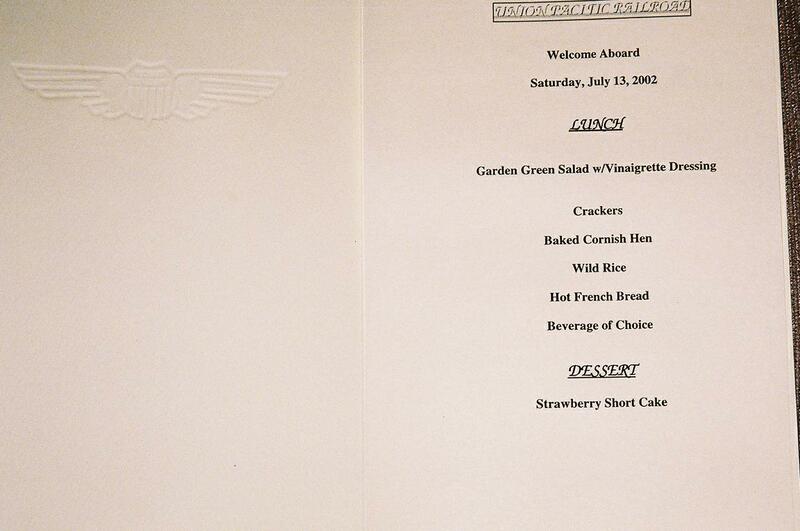 The chef was preparing lunch and the attendant took drink orders. ( All water w/lemon & iced tea) It was decided to have the meal at 13:30. We had a tour of the car. Two bed rooms with the bathroom in between. Large dining room, kitchen and crew quarters. Spring - Valley Junction - Spring"
Also 2 page milepost highlight of the sidings and business tracks we would pass on the 100.9 mile trip. A 50MPH heat speed restriction was in effect. Risk of thermal misalignments. 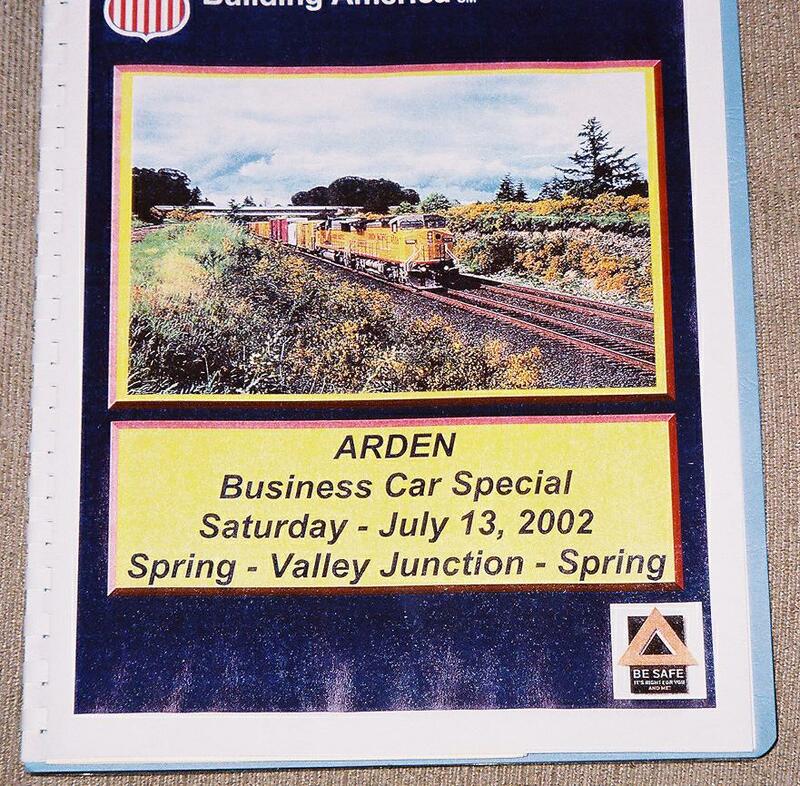 Steve Barkley gave a wonderful narrative on history of the Arden and Union Pacific in general. Picture of the Harriman's Farm in New York named Arden hangs in the car!! South end of Huffsmith siding (9175ft.) had a bad order car. Mr. Barkley inquired about it and I believe it was repaired today. At North end as I was taking a photo out the back a gentleman jumped out of the weeds and took a photo as we pulled away. Startled me. We waved as did he!! There was a Hi Rail waiting on Jerry Sidng or maybe it was Gozzoli waiting for us to pass to go South. It was lunch time before we knew it as we neared Navasota. A neat souvenir menu was at our placed. Vintage UP China and silverware graced the table. Started with Garden Green Salad w/Vinaigrette Dressing & Crackers. Then Baked Cornish Hen with wild rice and veggies, Hot French bread, and wonderful Strawberry Shortcake for Dessert. Caught a quick glimpse of first power in Navasota where a rock train was recently delivered. One of locomotives was CEFX BN Green. Passed a train headed Northbound in Millican siding. Appeared to be grain train with CNW Dash 9 on point. About the time we got to Bryan siding we finished desert and returned to comfy chairs in rear of car. We stopped on main for a rock train to clear. At Mumford we stopped next to a rock train while a San Antonio coal train blew by Southbound on Flatonia? Sub. At about 19:48 UP#4952 w/Arden returned to Spring. It was a wonderful trip. Thanks to Ron, Mr. Barkley and the rest of the great UP team. At MP 198 UP Palestine Sub. And Close to MP 72.1 BNSF Conroe Sub.